Building Blocks for Global Governance? Interregional Relations are a novel field within international relations which have increasingly been attracting scholarly interest. Thus, over the last five years or so, Interregional Relations has firmly established itself as a research field, initially within political science, and gradually in economics. This volume assesses interregional relations between Asia and Europe. It contributes to the most recent developments in research by providing impressively rich studies to test existing theoretical frameworks. 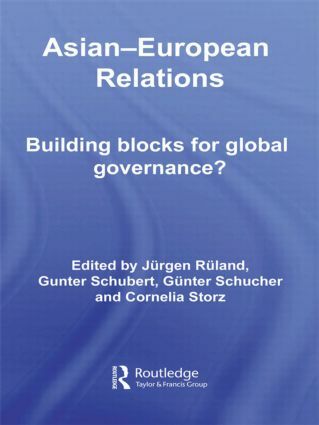 Featured in this volume are conceptual contributions, in particular, theoretically inspired studies which conduct in-depth investigation of a broad variety of interregional interactions, such as the political management of globalisation through interregional co-operation, regional security, human rights and finally, the dialogue between Asian and European NGOs. The economic contributions likewise undertake an extensive assessment of areas such as interregional trade and investment flows, the Asian Development Bank and interregional mergers. Applying established theories to concrete phenomena, Asian-European Relations provides a comprehensive understanding of inter-regionalism and how co-operation between Asia and Europe should be fashioned in the new millennium. The integration of political and economic research in this book will be of interest to graduates and researchers in the fields of international relations, international economics, regional integration, and interregionalism. Asian–European relations: More security through inter- and transregional relations?